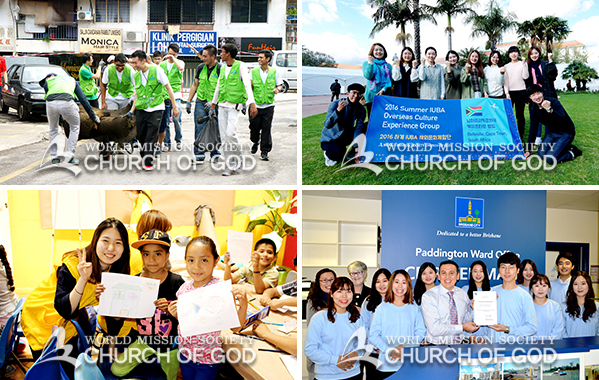 Over 200 university students from the Church of God had a special summer vacation, sharing friendship with people in the world. They volunteered to participate in the Overseas Culture Experience, which is a part of the education course of the International University Student Bible Academy [IUBA], and built up various experiences, carrying out meaningful activities in many places of the global village. The Overseas Culture Experience groups consisted of undergraduates who were putting their efforts into study. Through this overseas volunteer service and cultural exchange, they enlarged their experience and brought positive influence on the local communities as well. For three weeks from July 20 to August 11, the Overseas Culture Experience groups had busy schedules in 26 cities across 23 countries including Madrid in Spain, Paris in France, Amsterdam in the Netherlands, Kathmandu in Nepal, Kuala Lumpur in Malaysia, and New Delhi in India. They were very active especially in the field of voluntary service. In Nepal, where people were busy rebuilding the cities after the great earth-quake, they laid the foundation of the second Mother’s School and cleaned up streets with the local Church of God young adults. In New Delhi, India, where air pollution is a big problem, they held a tree planting campaign. In Quezon City, the Philippines, and in Buenos Aires, Argentina, local members and citizens carried out street cleanup campaigns. 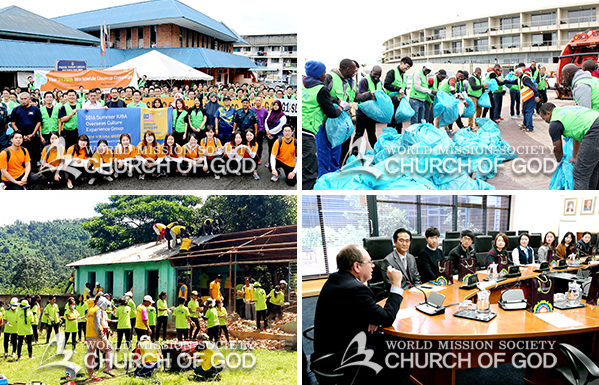 In London, U.K., and in Penang, Malaysia, they performed cleanup campaigns together with many organizations, including local government authorities and universities, and left a meaningful mark by leading people to participate in the campaigns and discussing future efforts. Cultural exchange programs were also carried out very actively. In Malaysia, they spread Korean culture through events such as taekwondo performance and traditional Korean costume [hanbok] experience. And in Puebla, Mexico, they made unforgettable memories through traditional Korean games and handicrafts. Local people, too, were much inspired by their activities, and many groups and public officials welcomed them and appreciated their efforts. In particular, since the Church of God received the Queen’s Award, the member states of the Commonwealth showed more interest in the church and their reaction was quite different than before. In the U.K., a local media covered the news about the Overseas Culture Experience group’s volunteer activities; the city councilor of Brisbane, Australia, delivered a letter of appreciation; furthermore, the Cape Town City Hall in South Africa agreed with them about their presentation on countermeasures against climate change, and promised sup-port for further activities. The students carried out the role of citizen diplomats as well in various fields. We expect them to continue their activities with upright belief, abundant knowledge, and passionate fervor.